Match Report by Chowndog ‘Panda Eyes’ ? “The first rule of Fight Club is: You do not talk about Fight Club.” However, what happened on the rugby pitch this past Saturday definitely deserves talking about as it proved to be a box office smash hit knock-out. A cast of reprobates resembling an assortment of characters from the films The Goonies, The Munsters and Fight Club (the ugly ones, not Brad Pitt or Edward Norton) travelled to Ipswich to take on their 3rd XV. We welcomed back several influential players to the team whose absence has been sorely missed over the past few seasons. This included Jason ‘Popeye’ Cooledge, Sam ‘Chopper’ Butcher and Moby ‘Inkz’ Turner. However, it was the much heralded return of Mark Elkin which was the real story here. Elkin, who since last playing rugby, has gone on to achieve world-wide fame on Facebook as a self-made scientist who predicts impending catastrophic disasters and has quite possibly written the most seminal text of modern times: Hidden Knowledge: Unraveling the pole shift (A guidebook) - a book Lewis Stratton calls “almost as good as ‘A Tiger Came To Tea’” - actually turned up for a match. For that we were to be very grateful as he proceeded to pull the strings at fly-half like a master puppeteer throughout the match; a richly deserved Man of the Match performance. Led by Captain Knapton, Mistley took to the field in overcast conditions, a light drizzle falling. As soon as Mistley received the kick-off, we dominated both possession and territory. The forwards made significant dents in Ipswich’s defence, often breaching the gain line. However, the most important factors were the quick phrase play from the likes of Big Charlie Barrett and the ever-improving Kevin Nave (Navedog), coupled with unyielding breakdown tenacity and support play from the rest of the forwards. This allowed the backs - expertly orchestrated by Elkin at fly-half - the time and space to exploit the gaps in Ipswich’s over-stretched defence. The times when Mistley had to defend were rare and predominantly in Ipswich’s half. Ipswich’s early tactic of going down the blindside off the back of scrums was promptly thwarted by blindside flanker, Chowndog, and scrum-half, Lucas ‘Biscuit’ Bissett. Although our line speed was a little slow at times, the drift and cover defence was excellent throughout the entire match; their backs either being scythed down, shepherded into touch or forced into knock-ons and errant passes. In fact, such was the total commitment/stupidity of one such player who needlessly contested a lost ruck - thus receiving a bloody blow to the nose and is now sporting the ‘panda eyes’ look - that the author of this report can only dreamily remember seeing a certain prop sprinting forty metres to score his finest ever Mistley try. First to score though was lock, Elliott Hamilton, who bull-dozed his way through several despairing tackles to score under the posts. Shortly after this opening try, something miraculous did indeed happen; and no, I wasn’t suffering from concussion (I think). Having compared Angus Bissett to a rampaging rhinoceros the other week, it is only fair to compare Ryan Knapton to a hunky hippopotamus. Often found wallowing in the murky depths of a scrum or bellowing his disapproval at a Mistley mistake which definitely isn’t his fault, once in a while Ryan surprises us with a sudden bolt of speed. This is exactly what happened, when, from forty metres out, he charged at full tilt and side-stepped a midget prop to score. 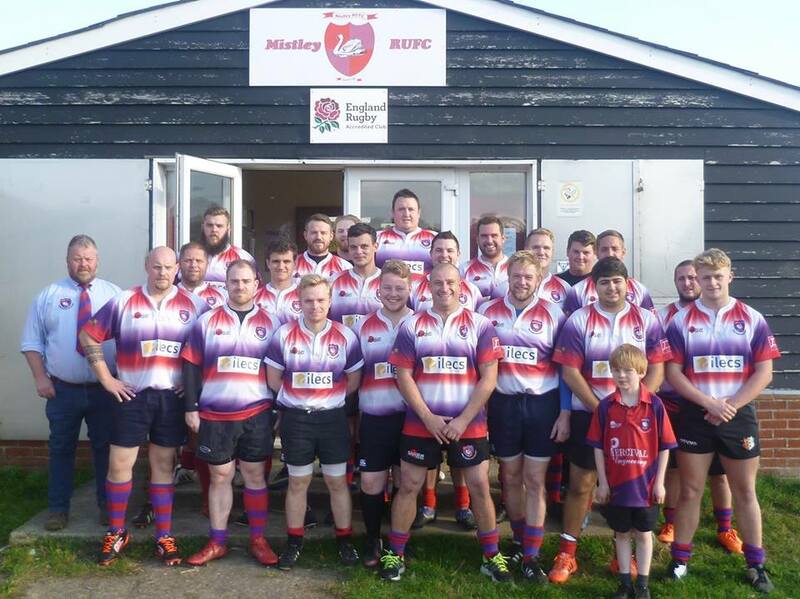 Thus, it was that the half-time score was 0-12 to Mistley. A good start, but it was to get even better in the second half. From the re-start our scrummaging quickly began to gain superiority; something which Ipswich’s pack had valiantly negated in the first half. From this platform, a dominant scrum ten metres out from Ipswich’s try-line led to the ball being passed sharply through the backs for outside centre, Moby Turner to power his way over the whitewash. Terry Regan was next to score, his excellent support play resulting in a twenty-five metre dash. Although he was tackled just short of the try-line, his momentum and strength carried him over. Dicky Johnson soon went over too, the mercurial full-back fielding a clearance kick near the half-way line before setting off on an arcing run to score a sensational try in the right hand corner. However, what happened next proves beyond any reasonable doubt that hilarity is never far away from Mistley RUFC. Despite several calls to the far touch-line for the kicking tee, the referee ended up whistling time on the conversion attempt. It later transpired that Suss had had the tee in his hand all along, making him the de facto DOTD, despite not playing. Sam Butcher, whose pace and power at inside centre had been causing carnage all-game, was finally rewarded with a try of his own after tearing Ipswich’s defence to shreds. This was quickly followed by another one of his barn-storming runs, the end result this time being a sublime offload out of the tackle to a supporting Moby, who trundled in to score in the 76th minute. The final denouement of this match almost resulted in one last try for Mistley. After a forceful break towards the try-line, Elliott Hamilton popped the ball to Chowndog, who quickly fed Strattz on the wing. Tight-roping the touch-line like a Russian Bolshoi ballerina, Strattz fended off the covering defender to dot down in the corner. However, Simon Carter had already raised his flag for a foot in touch, thus cruelly denying the try (Strattz’s words after the match) in the name of fair play. The whistle then blew and the Marauders emerged victorious with a resounding 0-41 win away from home. Ipswich, despite the score line, were very magnanimous in defeat. Apart from not conceding any points due to a ruthless performance both in attack and defence, probably the most pleasing aspect of this victory is that it shows the strength in depth which Mistley possesses this season. Many Marauders made strong cases for first team selection next week. This is an enviable position to be in right now, and one not to be taken for granted - Hadleigh 2nd XV having had to cancel the match against our 1st XV before withdrawing from Eastern Counties Two South. Finally, it was great to hear the Marauders song - sadly absent during last season’s demoralising campaign - being sung with gusto in the post-match huddle.